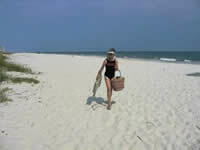 Gulf Shores and South Alabama resources and activities. Gulf Shores Attractions - Gulf Shores 20 acre water and amusement park. Alabama Coastal Foundation - Balancing the needs of recreation, tourism, commercial fishing, business, and industry with the protection of our priceless coastal resources. Alabama Birding Trail - Alabama birding trails & maps. Alabama Job Information - State of Alabama Personnel Department. View the application process, current and continuous jobs, etc. USS Alabama - The Battleship ALABAMA and her crew of 2,500 saw action in the Atlantic for a year before joining the Pacific Fleet in mid-1943. In July, 2002 the music video "RED, WHITE and BLUE" by singer Chris Gray was filmed aboard her. Alabama Tax, Fees and Admission Requirements - Premium Tax on Life & Health Premiums, Property and Casualty Premiums and more.